Info: Created on 22nd December 2008 . Last edited on 30th June 2009. I had over half of the uppercase finished before I decided they totally sucked, so I deleted them all. The lowercase isn't totally worthless, so I'm releasing it to the wild. And worthy it is indeed. I hope you can sustain the energy to fix the upper case. Caps can be discouraging, can't they. Not keen on the lower case y though. I'm not happy with the y or the z either. I need more angles! I need a break before I revisit the caps. It sounds ridiculous, but this font drained me. Instead of making caps you could just copy paste all the lowercase letters into where the caps go, making it a fully functional all lower case font. @aphoria You've really never seen Fakir? c f g m n look awfully Fakir-ish! @demonics Nope, I've never seen Fakir. At least, I hadn't seen it before graves09 asked in May, 2009. 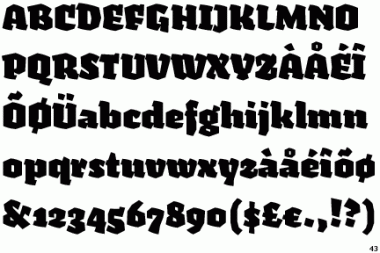 Being a blackletter, there are bound to be many fonts with similar characteristics. 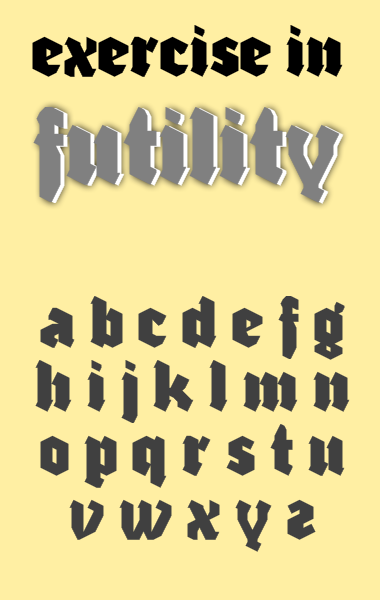 I did Futility pretty early in my FontStruct career, so the details are hazy, but I was trying to emulate one or more blackletter fonts that I had seen. Ah. I see. Actually, I was planning on making some variation of fakir or somewhat like it, but you beat me to it! Very nice font.